If you are pregnant and have rubella in the first few months of pregnancy, there is a high chance that the virus will cause severe damage to your developing baby. The virus affects the developing organs and the baby may be born with serious disability - the congenital rubella syndrome. Complications of congenital rubella syndrome include cataracts, deafness, and heart, lung and brain abnormalities. Having rubella infection in the first three months of pregnancy also increases your risk of having a miscarriage. The risks of your baby developing congenital rubella syndrome are greatest in the first 16 weeks of your pregnancy. The risk is highest in the first 12 weeks of pregnancy. The risk is much lower if you are more than 20 weeks pregnant. Rubella infection may begin with 1-2 days of mild fever (99-100°F, 37.2-37.8°C) and swollen, tender lymph nodes, usually in the back of the neck or behind the ears. A rash then begins on the face and spreads downward. As it spreads, it usually clears on the face. This rash is often the first sign of illness that a parent notices. The rubella rash can look like many other viral rashes. It appears as either pink or light red spots, which may merge to form evenly colored patches. The rash can itch and lasts up to 3 days. As the rash clears, the affected skin occasionally sheds in very fine flakes. Rubella in a pregnant woman can cause congenital rubella syndrome, with potentially devastating consequences for the developing fetus. Children who are infected with rubella before birth are at risk for growth retardation; mental retardation; malformations of the heart and eyes; deafness; and liver, spleen, and bone marrow problems. How is Rubella (German measles) spread? The rubella virus is found in the noses and throats of infected people. Direct contact with these secretions or exposure to the cough or sneeze of an infected person can spread the disease. How long can a person spread Rubella (German measles)? People infected with rubella are contagious for about one week before the rash and at least four days after the rash. How is Rubella (German measles) diagnosed? Who is at risk of getting Rubella (German measles)? Although rubella is most common among children and young adults, people of all ages can develop the disease. It has been estimated that one in five young adults is susceptible to rubella in the United States. Rubella is especially dangerous in women infected during the first few months of pregnancy because the virus can severely damage the fetus. Rubella cannot be treated with antibiotics because they do not work against viral infections. Unless there are complications, rubella will resolve on its own. Rubella is typically mild in kids, who often can be cared for at home. Monitor your child's temperature and call the doctor if the fever climbs too high. To relieve minor discomfort, you can give your child acetaminophen or ibuprofen. Do not give aspirin to a child with a viral illness because such use has been associated with the development of Reye syndrome, which can lead to liver failure and death. By ensuring that children are vaccinated at appropriate ages. People with rubella should be separated from non-immune people. This includes exclusion from public settings such as day-care centers, schools, or work. The vaccine is usually given to children at 12-15 months of age as part of the scheduled measles-mumps-rubella (MMR) immunization. A second dose of MMR is generally given at 4-6 years of age. As is the case with all immunization schedules, there are important exceptions and special circumstances. For example, if your child will be traveling outside the United States, the vaccine can be given as early as 6 months of age. Talk to your child’s doctor to see when the vaccine is needed. Pregnant female contacts, in their first few months of pregnancy, should have their blood tested for infection or immunity, and should be advised accordingly. Blood tests for rubella immunity should be done for all females before marriage, to identify susceptible women before pregnancy. Susceptible women should be immunized and advised to delay becoming pregnant for at least three months following immunization. Both male and female health care workers should be immunized against rubella, unless they can provide evidence of immunization or disease. You should have a blood test before you become pregnant. The blood test checks for antibodies in your blood to show that you are immune to rubella. Children are immunised against rubella as part of the routine childhood immunisation programme. However, in an extremely small number of children, the immunisation does not work well. In these children, when they become adults, their body does not have enough antibodies to protect against rubella. The only way to check whether you are immune is to have the blood test. This blood test may be offered in routine well woman checks given to younger women who have not yet become pregnant. If you have not had a test, your practice nurse can arrange for this to be done. Contact with Rubella (German measles) during your pregnancy, how to do? If you are pregnant and come into contact with someone with rubella, you should check your rubella status. Your midwife or doctor will normally have a record of this (from the blood test that was taken early in your pregnancy) if you do not know. Most women are immune due to previous immunisation and will not develop rubella. No further action is needed if you are known to be immune. If you are not immune and come into contact with someone with rubella then blood tests may be advised. These can tell if you are developing rubella before symptoms begin. Further action depends on the results of these tests. See a doctor if you are pregnant and develop an illness that you think may be rubella. 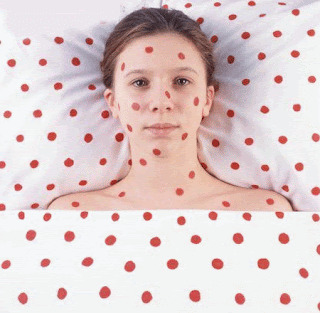 Other viruses can cause rashes similar to rubella. Most viruses do not harm the unborn child. Blood tests can confirm or rule out rubella if it is suspected. In the unlikely case that you are confirmed to have rubella, then you will be referred to an obstetrician to discuss the possibility of your baby having congenital rubella syndrome. Is there a test for Rubella (German measles) immunity? Blood tests are used to measure the amount of rubella antibodies in a person's blood. If a test shows rubella antibodies are present, a person is immune. If no rubella antibodies are present, a person is not protected against rubella. Is Rubella (German measles) vaccine safe? Rubella vaccine has an excellent record for safety. Swelling of the lymph glands in the neck or a rash could happen one to two weeks after getting the rubella vaccine. Mild pain or stiffness in the joints lasting three days may happen one to three weeks after getting the shot. What is the difference between rubella (German measles) and measles (rubeola)? 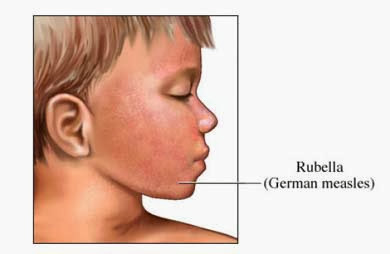 Rubella (German measles) is a mild, three day infection that seldom leads to complications in children. However, rubella may cause birth deformities in babies born to mothers who are infected during pregnancy. 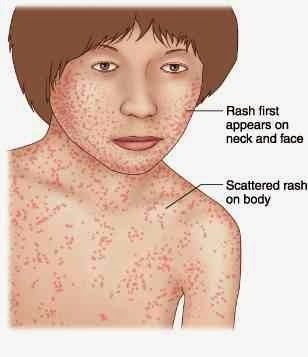 Measles (rubeola) is a serious disease and is sometimes called "hard," "red," or "seven day measles." Individuals infected with measles frequently suffer from ear infections and/or pneumonia. Measles. Some adults should be vaccinated against measles. Anyone who got their measles shot before their first birthday should get another measles shot. So should anyone who was vaccinated between 1963 and 1967 with certain vaccines that didn't work as well as those used today. Anyone entering college, working in a medical facility, or planning to travel overseas should also be vaccinated. If you are in one of these groups, or aren't sure, check with your doctor. Rubella. Experts recommend that all adolescents and adults should be immune to rubella. This is especially important for women who might become pregnant. Even if you think you have had rubella you might not be immune, because rubella is easy to confuse with other diseases. If you are not sure whether you are immune to rubella, it is a good idea to check with your doctor. Women should not get rubella vaccine if they are pregnant or might become pregnant within 3 months. However, if you are vaccinated and then find out you were pregnant at the time, it shouldn't be a cause for concern. Rubella vaccine has never been known to harm an unborn child. It is safe to have a child immunized even if there is a pregnant woman in the household. The rubella vaccine virus will not spread from the vaccinated child to the pregnant woman.